Eagles Training Camp 2015: Who Will be the Birds Next Go-to Receiver? 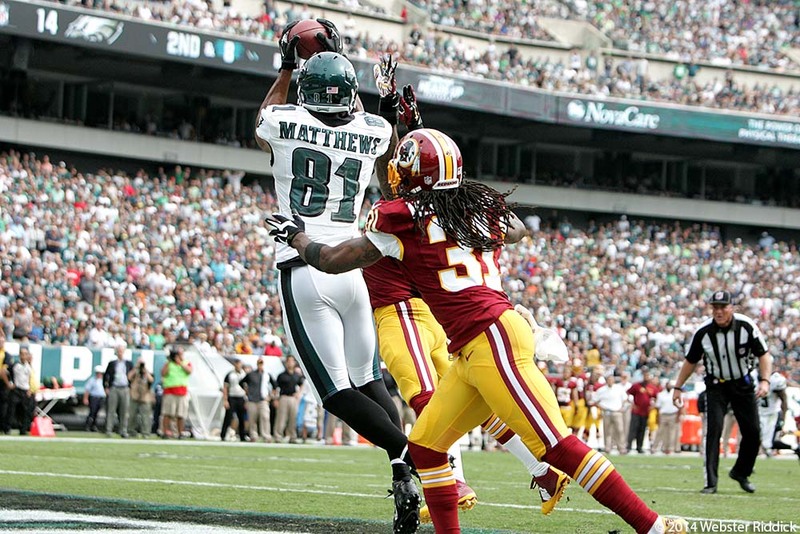 Eagles wide receiver Jordan Matthews had a big game as a rookie against Washington last season. The former Vanderbilt star caught two touchdown passes. Will he be the go-to guy in 2015? Photo by Webster Riddick. PHILADELPHIA—When Jeremy Maclin, the Philadelphia Eagles best receiver in 2014, signed a free agent deal with the Kansas City Chiefs, Birds fans have been wondering who’s going to be the guy that replaces his numbers in the offense. That will be one of the things to watch when Eagles training camp opens on August 1 at the team’s NovaCare facility in South Philadelphia. Last season, Maclin had 85 receptions for 1,318 yards and 10 touchdowns, not bad for a guy who didn’t have the game-breaking speed of a DeSean Jackson. The best returning receiver on the Eagles right now is second-year wide receiver Jordan Matthews, who had a solid rookie season. Last season, the former Vanderbilt star caught 67 passes for 872 yards and eight touchdowns. Matthews was the Eagles second-leading receiver in 2014. At 6-foot-3, 212 pounds, Matthews picked up most of his catches from playing inside the slot where he used to his height to his advantage. Throughout minicamp, he was still lining up at the slot. But I think he has the ability to play on the outside as well. Matthews said it doesn’t matter where they line him up, he’ll go out and do his job. “Of course, I’m getting some reps out there, but it’s still receiver,” Matthews said during the Eagles spring organized team activities. “Our offense is so dynamic that you can’t put too much weight on who’s outside or who’s inside…who’s No. 1 or No. 2. I think that’s stuff is really irrelevant. While not necessarily that homerun hitter on the deep ball, Matthews can be that go-to receiver in third down situations, something the Eagles haven’t had since Terrell Owens. Not to suggest that Matthews is on par with Owens when he was in his prime just yet, but I can see him lining up in the slot or on the outside. Meanwhile, the guy that could fill the role of a deep threat is rookie wide receiver Nelson Agholor. While the former USC star has yet to catch a pass in an NFL game, the Eagles No. 1 draft choice does come with some impressive collegiate credentials. The 6-1, 190-pound Agholor ran a 4.42 40-yard dash, which is by no means slow. During his final year at USC, Agholor caught 104 passes, 1,313 yards and 12 touchdowns while averaging 101 yards per game. He can go deep and he can run solid routes. Like Matthews, Agholor can run routes from the slot or from the outside receiver spots as did during his days at USC. During his freshman year at USC, Agholor was averaging a over 17 yards per catch, but during his final year with the Trojans he averaged a little over 12 yards per catch. Everyone in the Eagles receiving corps—young or old will definitely learn from the wisdom of former Dallas Cowboys/ Cleveland Browns wide receiver Miles Austin. In Cleveland last season, Austin played for a Browns squad that had instability at the quarterback spot, yet still managed to catch 47 passes for 568 yards with two touchdowns. Second-year wide receiver Josh Huff, who showed brilliant flashes of brilliance as a kick returner, is also looking to get some reps in the passing the game. Huff has the speed to move all over the place and he’s a good blocker in the run game. The odd man out among the veterans in this offense is Riley Cooper. Last season, Cooper did not have a good year, Cooper who saw his numbers drop in receiving yardage, average yards per catch and touchdowns.If Huff or one of the younger players has an outstanding camp, Cooper may not survive the summer.